ABC’s announced details on the upcoming Grey’s Anatomy season 15 and Station 19 season two crossover event. Grey’s Anatomy and its spinoff Station 19‘s storylines will intersect on Thursday, May 2, 2019. The Grey’s Anatomy episode that’s the first part of the crossover event will air at 8pm ET/PT followed by Station 19 at 9pm ET/PT. The current season of Grey’s Anatomy ranks first on Thursdays among women and its ranked first among all adults during the 8pm ET/PT time slot. Ellen Pompeo leads the cast as Meredith Grey, with Justin Chambers playing Alex Karev, Chandra Wilson is Miranda Bailey, James Pickens Jr. plays Richard Webber, Kevin McKidd is Owen Hunt, Jesse Williams stars as Jackson Avery, and Caterina Scorsone is Amelia Shepherd. 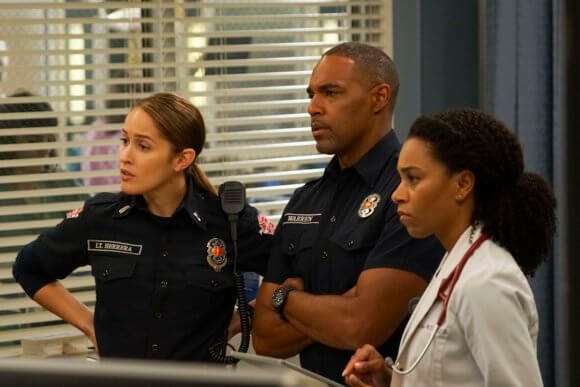 Station 19 starring Jaina Lee Ortiz, Jason George, Boris Kodjoe, and Grey Damon is the #1 show on Thursdays at 9pm among viewers ages 18 to 49. Barrett Doss, Alberto Frezza, Jay Hayden, Okieriete Onaodowan, Danielle Savre, and Miguel Sandoval also star in the series’ second season. Maggie treats one of Station 19’s own, and Jo learns a hard lesson. Meanwhile, when working with a family seeking asylum, Meredith makes a call that could jeopardize her career. Jesse Williams directed from a script by Mark Driscoll. Jaina Lee Ortiz, Jason George, Boris Kodjoe and Brett Tucker guest star. Following a deadly blaze inside a coffee beanery, the members of Station 19 find themselves on high alert as a beloved member of their team lands at Grey Sloan, leaving the future uncertain in the face of a life-threatening situation. “Always Ready” was written by Tia Napolitano and directed by Nicole Rubio. Brett Tucker, Kelly McCreary and Jake Borelli guest star.